Inspired by the James Tiptree, Jr., story about creatures who give their bodies as food so their mates may live through the long winters; and by Michelangelo's La Pieta, which depicts the Christ, who gave His body so that we might have Life. COMMENTS. Some of these comments are from the Elfwood art gallery, where this image is posted. Visually stunning! I love the colors you've used! Ingenius! Nice colors, cept the yellow arches in the background distract from the not-so-bright colors of the white alien creature. But maybe I don't know what I'm talking about. I love this pic. Great! Yeah, sure, it's clever, but I'm not sure I want religion hokum mixed in with my science fiction. I mean, isnt' SF supposed to be about SCIENCE and hard facts and stuff instead of about feelings and faith and squishy things like that--- I mean, in science, we KNOW, in religion we BELIEVE - aren't the two incompatible? Am I the only one who thought this was funny? I, too see the intersection of ideas, but I also see a great deal of humor in the intersection of two such strong, yet seemingling unrelated images. My vote is: Two big thumbs up, one for the artistry, the other for the humor in the artist. It's beautiful...no matter what kind of creature it may be you can still see the love in it. And science and religion shouldn't be at odds that much, they're both after one thing, which is truth. The stained glass version was a great idea. Keep turning out the artwork. Really like the paintings and I think that the new stained glass version of your painting. Love is the plan - the plan is death is better than the old one. Especially with the religious overtones. It really works, plus its great to see the classic look of a religious window with totally different subject matter in them. 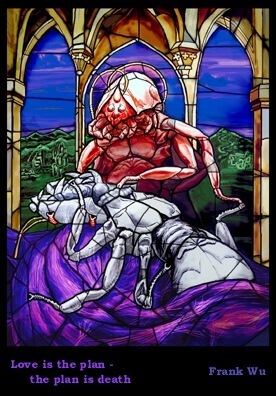 If I where you I would do a whole series of stained glass windows. You could arrange them in a gallery like they where the windows of a church. You know like all the same size along the sides of the room a big one at one end . where the altar usually is, that Would be a great show. It's so twisted, I love it! It's included in my "Through a Stained Glass Window" Tour! Ah! I love it. And it does look like the Pieta! I'd love to know how you did the swirls in that blanket.